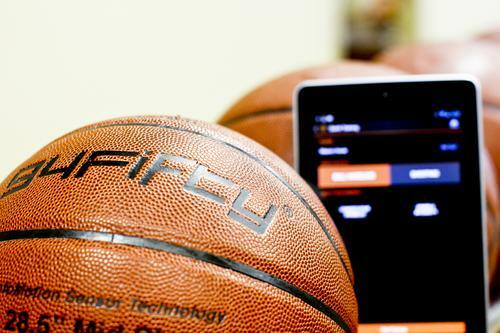 A new smart basketball can measure the arc and backspin on a shot, or the speed and force of a player’s dribbling. ”Now, when coaches say, ‘Your left hand is weak,’ they can prove it,” Mark Davisson, president of InfoMotion Sports Technologies, told Design News. “The ball doesn’t lie.” Known as the 94Fifty, the smart basketball employs a combination of nine sensors — including accelerometers, gyroscopes, and a magnetometer — to gather 6,000 pieces of data per second and send them to a processor for analysis. Designed by engineers at Infomotion, it incorporates the sensors, along with a digital signal processor, a Bluetooth communication system-on-chip (SOC), and an inductive power charging antenna inside the lining of the ball. Click on the image below for a close-up look at the 94Fifty. When a player shoots or dribbles the 94Fifty, onboard “event recognition” algorithms take inertial data from the sensors and determine what’s happening. Accelerometers provide force information, gyroscopes supply angular rate data, and the magnetometer determines magnetic north and provides directional information. Taking all the data together, the ball is then able to tell how much force and control players have while dribbling, how much arc or backspin they have on a shot, or how long it takes for them to catch and shoot. After gathering the information, it sends it via Bluetooth wireless to a smartphone or tablet computer, so players can view data seconds after it’s been measured. “We have an app that visualizes the information in real time,” Kevin King, vice president of engineering for InfoMotion, told us. “You can take a shot, and as soon as the ball hits the floor afterward, the information is there.” InfoMotion initially developed the technology about two years ago, selling the basketball along with a laptop computer to teams for more than $2,000. Users included high schools, colleges, and at least one pro team. Over time, however, the company’s engineering staff was able to incorporate the software and hardware inside the ball and cut the price. A consumer ball, for use by an individual, is expected to be available by October for $295. “We realized there was a market for kids to take the ball into the driveway and do their own drills without a coach,” King told us. InfoMotion teamed with Texas Instruments on the development of the consumer ball. TI engineers provided a C5000 digital signal processor (DSP), a Bluetooth/Bluetooth Low Energy communications SOC, and a Qi-compliant wireless power technology system that enables the ball’s onboard battery to be charged without plugs or wires.